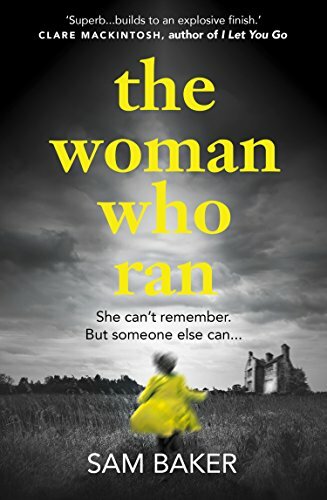 The Woman Who Ran by Sam Baker begins with a woman, Helen, moving into a dilapidated property called Wildfell near a small, close-knit Yorkshire village. Her arrival immediately sparks gossip. Who is she? Why has she moved into such a lonely property? Why does she want to spend so much time alone? And Helen also captures the interest of Gil Markham, who finds himself determined to find out more. If this sounds familiar, that's because The Woman Who Ran is heavily inspired by Anne Brontë's brilliant The Tenant Of Wildfell Hall. The plot is roughly similar and consequently, if you've read the Brontë novel there will be revelations in The Woman Who Ran that won't come as a surprise to you, but it's not a straight retelling by any means. The last thing Helen remembers before she fled to Wildfell was her Paris apartment burning down, with the dead body of a man in it. But who was he, and why can't Helen remember how the fire started? We know that war photographer Helen was married to a reporter, Art Huntingdon, but where is he now, and what happened to their relationship? The publisher bills this book as 'a gripping psychological thriller that builds to an explosive finish', but I think perhaps this does it rather a disservice by giving readers particular expectations that won't be met, and downplaying other aspects of the book which are actually more striking. I wouldn't call The Woman Who Ran a psychological thriller, or even a thriller, really. For the majority of the book the pace is slow, and although Helen's story is told with the structure of a mystery, it's really a portrait of a woman with PTSD trying to rebuild her life and is stronger on character than plot, building detailed and convincing portraits of both Helen and Gil. With so many books with 'Girl' in the title climbing up the bestseller lists in recent years, it was refreshing that Helen is very much a woman - a tough, successful and resourceful career woman of around 40 - while Gil is approaching retirement and has grown-up children of his own. Baker is an observant and perceptive writer with a keen eye for detail and it was only really at the very end that I started to feel my belief was being stretched a little too far. The last quarter or so of the book was the weakest, with the sudden introduction of a rather bland character barely mentioned before feeling like an over-convenient cop-out. There is also an element to the story which almost felt like it came from a different book altogether: a small, dark-haired boy Helen repeatedly sees. It's assumed that this is a symptom of her PTSD, but there is also a hint that it could be something more than this. Much as I like ghost stories, I'd rather that hint hadn't been there, as it feels terribly out of place and under-explored. There aren't many surprises in this book: it's not the gripping page-turner it's been marketed as and the plot doesn't really measure up to the initial premise. It is, however, a well-written novel with characters and settings that seem to leap fully-formed from the page.